"Jerrymander" redirects here. Jerrymander may also refer to the arachnid known as Solifugae. 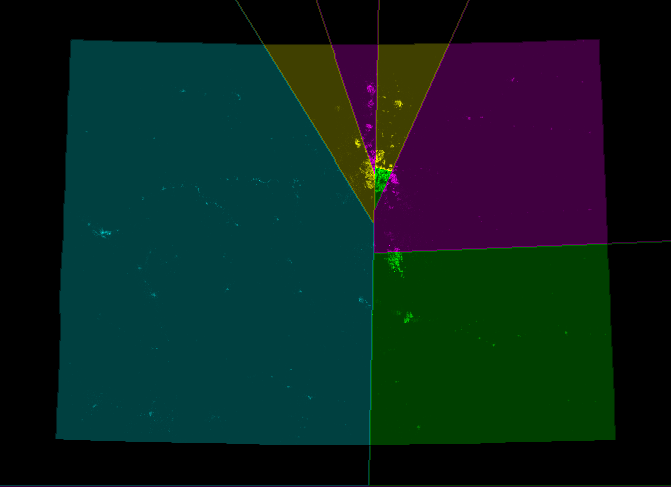 For the 2010 documentary film, see Gerrymandering (film). In the process of setting electoral districts, gerrymandering is a practice intended to establish a political advantage for a particular party or group by manipulating district boundaries. The resulting district is known as a gerrymander (/ˈdʒɛriˌmændər/); however, that word can also refer to the process. The term gerrymandering has negative connotations. In addition to its use achieving desired electoral results for a particular party, gerrymandering may be used to help or hinder a particular demographic, such as a political, ethnic, racial, linguistic, religious, or class group, such as in U.S. federal voting district boundaries that produce a majority of constituents representative of African-American or other racial minorities, known as "majority-minority districts". Gerrymandering can also be used to protect incumbents. Gerrymandering should not be confused with malapportionment, whereby the number of eligible voters per elected representative can vary widely without relation to how the boundaries are drawn. Nevertheless, the ~mander suffix has been applied to particular malapportionments. Sometimes political representatives use both gerrymandering and malapportionment to try to maintain power. Printed in March 1812, this political cartoon was drawn in reaction to the newly drawn state senate election district of South Essex created by the Massachusetts legislature to favor the Democratic-Republican Party candidates of Governor Elbridge Gerry over the Federalists. 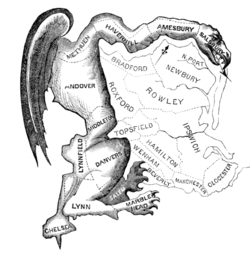 The caricature satirizes the bizarre shape of a district in Essex County, Massachusetts, as a dragon-like "monster". Federalist newspaper editors and others at the time likened the district shape to a salamander, and the word gerrymander was a blend of that word and Governor Gerry's last name. 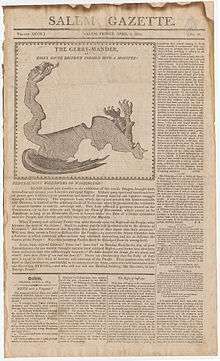 The word gerrymander (originally written Gerry-mander) was used for the first time in the Boston Gazette on 26 March 1812. The word was created in reaction to a redrawing of Massachusetts state senate election districts under Governor Elbridge Gerry (pronounced /ˈɡɛri/; 1744–1814). In 1812, Governor Gerry signed a bill that redistricted Massachusetts to benefit his Democratic-Republican Party. When mapped, one of the contorted districts in the Boston area was said to resemble the shape of a salamander. The original gerrymander, and original 1812 gerrymander cartoon, depict the Essex South state senatorial district for the legislature of The Commonwealth of Massachusetts. Gerrymander is a portmanteau of the governor's last name and the word salamander. The redistricting was a notable success. Although in the 1812 election both the Massachusetts House and governorship were won by Federalists by a comfortable margin and cost Gerry his job, the redistricted state senate remained firmly in Democratic-Republican hands. The author of the term gerrymander may never be definitively established. Historians widely believe that the Federalist newspaper editors Nathan Hale, and Benjamin and John Russell coined the term, but the historical record does not have definitive evidence as to who created or uttered the word for the first time. Appearing with the term, and helping spread and sustain its popularity, was a political cartoon depicting a strange animal with claws, wings and a dragon-like head satirizing the map of the oddly shaped district. This cartoon was most likely drawn by Elkanah Tisdale, an early 19th-century painter, designer, and engraver who was living in Boston at the time. Tisdale had the engraving skills to cut the woodblocks to print the original cartoon. These woodblocks survive and are preserved in the Library of Congress. The word gerrymander was reprinted numerous times in Federalist newspapers in Massachusetts, New England, and nationwide during the remainder of 1812. This suggests some organized activity of the Federalists to disparage Governor Gerry in particular, and the growing Democratic-Republican party in general. Gerrymandering soon began to be used to describe not only the original Massachusetts example, but also other cases of district shape manipulation for partisan gain in other states. According to the Oxford English Dictionary, the word's acceptance was marked by its publication in a dictionary (1848) and in an encyclopedia (1868). Since the letter g of the eponymous Gerry is pronounced /ɡ/ as in go, the word gerrymander was originally pronounced /ˈɡɛrimændər/. However, pronunciation as /ˈdʒɛrimændər/, with a /dʒ/ as in gentle, has become the accepted pronunciation. From time to time, other names are given the "-mander" suffix to tie a particular effort to a particular politician or group. These include the 1852 "Henry-mandering", "Jerrymander" (referring to California Governor Jerry Brown), "Perrymander" (a reference to Texas Governor Rick Perry), and "Tullymander" (after the Irish politician James Tully). Gerrymandering is used most often in favor of ruling incumbents or a specific political party—the one drawing the map. Societies whose legislatures use a single-winner voting system are the most likely to have political parties that gerrymander for advantage. Most notably, gerrymandering is particularly effective in non-proportional systems that tend towards fewer parties, such as first past the post. In proportional-election systems, where political parties are represented in proportion to the total numbers of votes they receive, gerrymandering has little or less significance. Some countries, such as Australia, Canada, and the UK, authorize non-partisan organizations to set constituency boundaries in an attempt to prevent gerrymandering. Gerrymandering is most common in countries where elected politicians are responsible for defining constituency boundaries. They have an obvious and immediate interest in the outcome of the process. This satirical map reflects the origin of the word "gerrymander", by Elkanah Tisdale in 1813. "Cracking" involves spreading voters of a particular type among many districts in order to deny them a sufficiently large voting bloc in any particular district. An example would be to split the voters in an urban area among several districts wherein the majority of voters are suburban, on the presumption that the two groups would vote differently, and the suburban voters would be far more likely to get their way in the elections. "Packing" is to concentrate as many voters of one type into a single electoral district to reduce their influence in other districts. In some cases, this may be done to obtain representation for a community of common interest (such as to create a majority-minority district), rather than to dilute that interest over several districts to a point of ineffectiveness (and, when minority groups are involved, to avoid possible racial discrimination). When the party controlling the districting process has a statewide majority, packing is usually not necessary to attain partisan advantage; the minority party can generally be "cracked" everywhere. Packing is therefore more likely to be used for partisan advantage when the party controlling the districting process has a statewide minority, because by forfeiting a few districts packed with the opposition, cracking can be used in forming the remaining districts. "Hijacking" redraws two districts in such a way as to force two incumbents of the same political party to run against each other in one district, ensuring that one of them will be eliminated, while usually leaving the other district to be won by someone from a different political party. "Kidnapping" aims to move areas where a certain elected official has significant support to another district, making it more difficult to win future elections with a new electorate. This is often employed against politicians who represent multiple urban areas, in which larger cities will be removed from the district in order to make the district more rural. These tactics are typically combined in some form, creating a few "forfeit" seats for packed voters of one type in order to secure more seats and greater representation for voters of another type. This results in candidates of one party (the one responsible for the gerrymandering) winning by small majorities in most of the districts, and another party winning by a large majority in only a few of the districts. Gerrymandering is effective because of the wasted vote effect. Wasted votes are votes did not contribute to electing a candidate, either because they were in excess of the bare minimum needed for victory or because the candidate lost. By moving geographic boundaries, the incumbent party packs opposition voters into a few districts they will already win, wasting the extra votes. Other districts are more tightly constructed with the opposition party allowed a bare minority count, thereby wasting all the minority votes for the losing candidate. These districts constitute the majority of districts and are drawn to produce a result favoring the incumbent party. A quantitative measure of the effect of gerrymandering is the efficiency gap, computed from the difference in the wasted votes for two different political parties summed over all the districts. When the parties win district elections in rough proportion to their electoral popularity, the efficiency gap is near zero. Citing in part an efficiency gap of 11.69% to 13%, a U.S. District Court in 2016 ruled against the 2011 drawing of Wisconsin legislative districts. In the 2012 election for the state legislature, that gap in wasted votes meant that one party had 48.6% of the two-party votes but won 61% of the 99 districts. While the wasted vote effect is strongest when a party wins by narrow margins across multiple districts, gerrymandering narrow margins can be risky when voters are less predictable. To minimize the risk of demographic or political shifts swinging a district to the opposition, politicians can create more packed districts, leading to more comfortable margins in unpacked ones. North Carolina's 12th congressional district is an example of packing. The district has predominantly African-American residents who vote for Democrats. Designed to proportionally segment voters of the Democratic Party, California's 23rd congressional district, was confined to a narrow strip of coast, an example of the packing style of districting. The district was redrawn after the 2010 census by California's non-partisan commission and no longer follows these boundaries. An example of "cracking" style of gerrymandering. The urban (and mostly liberal Democratic) concentration of Columbus, Ohio, located at the center of the map in Franklin County, is split into thirds, each segment attached to—and outnumbered by—largely conservative suburbs that vote Republican. California's 11th congressional district drawn to favor its then-Republican incumbent. It was redrawn after the 2010 census. 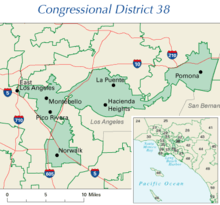 Bi-partisan incumbent gerrymandering produced California District 38, home to Grace Napolitano, a Democrat, who ran unopposed in 2004. 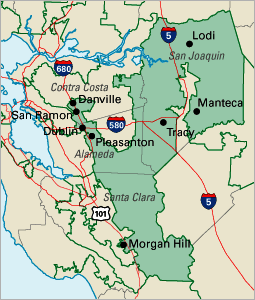 This district was redrawn by California's non-partisan commission after the 2010 census. Texas' controversial 2003 partisan gerrymander produced Texas District 22 for former Rep. Tom DeLay, a Republican. 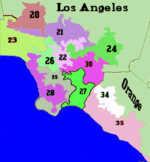 The odd shapes of California Senate districts in southern California (2008) have led to complaints of gerrymandering. The earmuff shape of Illinois's 4th congressional district packs two Hispanic areas while retaining narrow contiguity along Interstate 294. After the Democrat Jim Matheson was elected in 2000, the Utah legislature redrew the 2nd congressional district to favor future Republican majorities. The predominantly Democratic city of Salt Lake was connected to predominantly Republican eastern and southern Utah through a thin sliver of land running through Utah County. Nevertheless, Matheson continued to be re-elected. In 2011, the legislature created new congressional districts that combined conservative rural areas with more urban areas to dilute Democratic votes. Illinois's 17th congressional district in the western portion of the state is gerrymandered: the major urban centers are anchored and Decatur is included, although nearly isolated from the main district. Gerrymandering in its most basic form. How Gerrymandering can influence electoral results on a non-proportional system. Example for a state with 3 equally sized districts, 15 voters and 2 parties: Plum (squares) and Orange (circles). In (a), creating 3 mixed-type districts yields a 3–0 win to Plum—a disproportional result considering the statewide 9:6 Plum majority. In (b), Orange wins the urban district while Plum wins the rural districts—the 2–1 result reflects the statewide vote ratio. In (c), gerrymandering techniques ensure a 2–1 win to the statewide minority Orange party. Some political science research suggests that, contrary to common belief, gerrymandering does not decrease electoral competition, and can even increase it. Some say that, rather than packing the voters of their party into uncompetitive districts, party leaders tend to prefer to spread their party's voters into multiple districts, so that their party can win a larger number of races. (See scenario (c) in the box.) This may lead to increased competition. Instead of gerrymandering, some researchers find that other factors, such as partisan polarization and the incumbency advantage, have driven the recent decreases in electoral competition. Similarly, a 2009 study found that "congressional polarization is primarily a function of the differences in how Democrats and Republicans represent the same districts rather than a function of which districts each party represents or the distribution of constituency preferences." These findings are, however, a matter of some dispute. While gerrymandering may not decrease electoral competition in all cases, there are certainly instances where gerrymandering does reduce such competition. One state in which gerrymandering has arguably had an adverse effect on electoral competition is California. In 2000, a bipartisan redistricting effort redrew congressional district lines in ways that all but guaranteed incumbent victories; as a result, California saw only one congressional seat change hands between 2000 and 2010. In response to this obvious gerrymandering, a 2010 referendum in California gave the power to redraw congressional district lines to the California Citizens Redistricting Commission, which had been created to draw California State Senate and Assembly districts by another referendum in 2008. In stark contrast to the redistricting efforts that followed the 2000 census, the redistricting commission has created a number of the most competitive congressional districts in the country. The effect of gerrymandering for incumbents is particularly advantageous, as incumbents are far more likely to be reelected under conditions of gerrymandering. For example, in 2002, according to political scientists Norman Ornstein and Thomas Mann, only four challengers were able to defeat incumbent members of the U.S. Congress, the lowest number in modern American history. Incumbents are likely to be of the majority party orchestrating a gerrymander, and incumbents are usually easily renominated in subsequent elections, including incumbents among the minority. Mann, a Senior Fellow of Governance Studies at the Brookings Institution, has also noted that "Redistricting is a deeply political process, with incumbents actively seeking to minimize the risk to themselves (via bipartisan gerrymanders) or to gain additional seats for their party (via partisan gerrymanders)". The bipartisan gerrymandering that Mann mentions refers to the fact that legislators often also draw distorted legislative districts even when such redistricting does not provide an advantage to their party. Gerrymandering of state legislative districts can effectively guarantee an incumbent’s victory by ‘shoring up’ a district with higher levels of partisan support, without disproportionately benefiting a particular political party. This can be highly problematic from a governance perspective, because forming districts to ensure high levels of partisanship often leads to higher levels of partisanship in legislative bodies. If a substantial number of districts are designed to be polarized, then those districts' representation will also likely act in a heavily partisan manner, which can create and perpetuate partisan gridlock. This demonstrates that gerrymandering can have a deleterious effect on the principle of democratic accountability. With uncompetitive seats/districts reducing the fear that incumbent politicians may lose office, they have less incentive to represent the interests of their constituents, even when those interests conform to majority support for an issue across the electorate as a whole. Incumbent politicians may look out more for their party's interests than for those of their constituents. Gerrymandering can affect campaign costs for district elections. If districts become increasingly stretched out, candidates must pay increased costs for transportation and trying to develop and present campaign advertising across a district. The incumbent's advantage in securing campaign funds is another benefit of his or her having a gerrymandered secure seat. Gerrymandering also has significant effects on the representation received by voters in gerrymandered districts. Because gerrymandering can be designed to increase the number of wasted votes among the electorate, the relative representation of particular groups can be drastically altered from their actual share of the voting population. This effect can significantly prevent a gerrymandered system from achieving proportional and descriptive representation, as the winners of elections are increasingly determined by who is drawing the districts rather than the preferences of the voters. Gerrymandering may be advocated to improve representation within the legislature among otherwise underrepresented minority groups by packing them into a single district. This can be controversial, as it may lead to those groups' remaining marginalised in the government as they become confined to a single district. Candidates outside that district no longer need to represent them to win elections. As an example, much of the redistricting conducted in the United States in the early 1990s involved the intentional creation of additional "majority-minority" districts where racial minorities such as African Americans were packed into the majority. This "maximization policy" drew support by both the Republican Party (who had limited support among African Americans and could concentrate their power elsewhere) and by minority representatives elected as Democrats from these constituencies, who then had safe seats. The 2012 election provides a number of examples as to how partisan gerrymandering can adversely affect the descriptive function of states' congressional delegations. In Pennsylvania, for example, Democratic candidates for the House of Representatives received 83,000 more votes than Republican candidates, yet the Republican-controlled redistricting process in 2010 resulted in Democrats losing to their Republican counterparts in 13 out of Pennsylvania’s 18 districts. In the seven states where Republicans had complete control over the redistricting process, Republican House candidates received 16.7 million votes and Democratic House candidates received 16.4 million votes. The redistricting resulted in Republican victories in 73 out of the 107 affected seats; in those 7 states, Republicans received 50.4% of the votes but won in over 68% of the congressional districts. While it is but one example of how gerrymandering can have a significant effect on election outcomes, this kind of disproportional representation of the public will seems to be problematic for the legitimacy of democratic systems, regardless of one's political affiliation. In Michigan, redistricting was constructed by a Republican Legislature in 2011. Federal congressional districts were so designed that cities such as Battle Creek, Grand Rapids, Jackson, Kalamazoo, Lansing, and East Lansing were separated into districts with large conservative-leaning hinterlands that essentially diluted the Democratic votes in those cities in Congressional elections. Since 2010 not one of those cities is within a district in which a Democratic nominee for the House of Representatives has a reasonable chance of winning, short of Democratic landslide. Gerrymandering can also be done to help incumbents as a whole, effectively turning every district into a packed one and greatly reducing the potential for competitive elections. This is particularly likely to occur when the minority party has significant obstruction power—unable to enact a partisan gerrymander, the legislature instead agrees on ensuring their own mutual reelection. In an unusual occurrence in 2000, for example, the two dominant parties in the state of California cooperatively redrew both state and Federal legislative districts to preserve the status quo, ensuring the electoral safety of the politicians from unpredictable voting by the electorate. This move proved completely effective, as no State or Federal legislative office changed party in the 2004 election, although 53 congressional, 20 state senate, and 80 state assembly seats were potentially at risk. In 2006, the term "70/30 District" came to signify the equitable split of two evenly split (i.e. 50/50) districts. The resulting districts gave each party a guaranteed seat and retained their respective power base. Prison-based gerrymandering occurs in places like New York when prisoners are counted as residents of a particular district, increasing the district's population with non-voters when assigning political apportionment. This phenomenon violates the principle of one person, one vote because, although many prisoners come from (and return to) urban communities, they are counted as "residents" of the rural districts that contain large prisons, thereby artificially inflating the political representation in districts with prisons at the expense of voters in all other districts without prisons. Others contend that prisoners should not be counted as residents of their original districts when they do not reside there and are not legally eligible to vote. Electoral divisions in the Sydney area, drawn by the politically independent Australian Electoral Commission. Due to the perceived issues associated with gerrymandering and its effect on competitive elections and democratic accountability, numerous countries have enacted reforms making the practice either more difficult or less effective. Countries such as the U.K., Australia, Canada and most of those in Europe have transferred responsibility for defining constituency boundaries to neutral or cross-party bodies. In the United States, however, such reforms are controversial and frequently meet particularly strong opposition from groups that benefit from gerrymandering. In a more neutral system, they might lose considerable influence. The most commonly advocated electoral reform proposal targeted at gerrymandering is to change the redistricting process. Under these proposals, an independent and presumably objective commission is created specifically for redistricting, rather than having the legislature do it. This is the system used in the United Kingdom, where the independent boundary commissions determine the boundaries for constituencies in the House of Commons and the devolved legislatures, subject to ratification by the body in question (almost always granted without debate). A similar situation exists in Australia where the independent Australian Electoral Commission and its state-based counterparts determine electoral boundaries for federal, state and local jurisdictions. To help ensure neutrality, members of a redistricting agency may be appointed from relatively apolitical sources such as retired judges or longstanding members of the civil service, possibly with requirements for adequate representation among competing political parties. Additionally, members of the board can be denied access to information that might aid in gerrymandering, such as the demographic makeup or voting patterns of the population. As a further constraint, consensus requirements can be imposed to ensure that the resulting district map reflects a wider perception of fairness, such as a requirement for a supermajority approval of the commission for any district proposal. Consensus requirements, however, can lead to deadlock, such as occurred in Missouri following the 2000 census. There, the equally numbered partisan appointees were unable to reach consensus in a reasonable time, and consequently the courts had to determine district lines. In the U.S. state of Iowa, the nonpartisan Legislative Services Bureau (LSB, akin to the U.S. Congressional Research Service) determines boundaries of electoral districts. Aside from satisfying federally mandated contiguity and population equality criteria, the LSB mandates unity of counties and cities. Consideration of political factors such as location of incumbents, previous boundary locations, and political party proportions is specifically forbidden. Since Iowa's counties are chiefly regularly shaped polygons, the LSB process has led to districts that follow county lines. In 2005, the U.S. state of Ohio had a ballot measure to create an independent commission whose first priority was competitive districts, a sort of "reverse gerrymander". A complex mathematical formula was to be used to determine the competitiveness of a district. The measure failed voter approval chiefly due to voter concerns that communities of interest would be broken up. When a single political party controls both legislative houses of a state during redistricting, both Democrats and Republicans have displayed a marked propensity for couching the process in secrecy; in May 2010, for example, the Republican National Committee held a redistricting training session in Ohio where the theme was "Keep it Secret, Keep it Safe". The need for increased transparency in redistricting processes is clear; a 2012 investigation by The Center for Public Integrity reviewed every state’s redistricting processes for both transparency and potential for public input, and ultimately assigned 24 states grades of either D or F.
In response to these types of problems, redistricting transparency legislation has been introduced to US Congress a number of times in recent years, including the Redistricting Transparency Acts of 2010, 2011, and 2013. Such policy proposals aim to increase the transparency and responsiveness of the redistricting systems in the US. The merit of increasing transparency in redistricting processes is based largely on the premise that lawmakers would be less inclined to draw gerrymandered districts if they were forced to defend such districts in a public forum. Because gerrymandering relies on the wasted-vote effect, the use of a different voting system with fewer wasted votes can help reduce gerrymandering. In particular, the use of multi-member districts alongside voting systems establishing proportional representation such as single transferable voting can reduce wasted votes and gerrymandering. Semi-proportional voting systems such as single non-transferable vote or cumulative voting are relatively simple and similar to first past the post and can also reduce the proportion of wasted votes and thus potential gerrymandering. Electoral reformers have advocated all three as replacement systems. Electoral systems with various forms of proportional representation are now found in nearly all European countries, resulting in multi-party systems (with many parties represented in the parliaments) with higher voter attendance in the elections, fewer wasted votes, and a wider variety of political opinions represented. Electoral systems with election of just one winner in each district (i.e., "winner-takes-all" electoral systems) and no proportional distribution of extra mandates to smaller parties tend to create two-party systems (Duverger's law). In these, just two parties effectively compete in the national elections and thus the national political discussions are forced into a narrow two-party frame, where loyalty and forced statements inside the two parties distort the political debate. If a proportional or semi-proportional voting system is used then increasing the number of winners in any given district will reduce the number of wasted votes. This can be accomplished both by merging separate districts together and by increasing the total size of the body to be elected. Since gerrymandering relies on exploiting the wasted vote effect, increasing the number of winners per district can reduce the potential for gerrymandering in proportional systems. Unless all districts are merged, however, this method cannot eliminate gerrymandering entirely. In contrast to proportional methods, if a nonproportional voting system with multiple winners (such as block voting) is used, then increasing the size of the elected body while keeping the number of districts constant will not reduce the amount of wasted votes, leaving the potential for gerrymandering the same. While merging districts together under such a system can reduce the potential for gerrymandering, doing so also amplifies the tendency of block voting to produce landslide victories, creating a similar effect to gerrymandering by concentrating wasted votes among the opposition and denying them representation. If a system of single-winner elections is used, then increasing the size of the elected body will implicitly increase the number of districts to be created. This change can actually make gerrymandering easier when raising the number of single-winner elections, as opposition groups can be more efficiently packed into smaller districts without accidentally including supporters, further increasing the number of wasted votes amongst the opposition. Another way to avoid gerrymandering is simply to stop redistricting altogether and use existing political boundaries such as state, county, or provincial lines. While this prevents future gerrymandering, any existing advantage may become deeply ingrained. The United States Senate, for instance, has more competitive elections than the House of Representatives due to the use of existing state borders rather than gerrymandered districts—Senators are elected by their entire state, while Representatives are elected in legislatively drawn districts. The use of fixed districts creates an additional problem, however, in that fixed districts do not take into account changes in population. Individual voters can come to have very different degrees of influence on the legislative process. This malapportionment can greatly affect representation after long periods of time or large population movements. In the United Kingdom during the Industrial Revolution, several constituencies that had been fixed since they gained representation in the Parliament of England became so small that they could be won with only a handful of voters (rotten boroughs). Similarly, in the U.S. the state legislature of Alabama refused to redistrict for more than 60 years, despite major changes in population patterns. By 1960 less than a quarter of the state's population controlled the majority of seats in the legislature. However, this practice of using fixed districts for state legislatures was effectively banned in the United States after the Reynolds v. Sims Supreme Court decision in 1964, establishing a rule of one man, one vote. Another means to reduce gerrymandering is to create objective, precise criteria to which any district map must comply. Courts in the United States, for instance, have ruled that congressional districts must be contiguous in order to be constitutional. This, however, is not a particularly binding constraint, as very narrow strips of land with few or no voters in them may be used to connect separate regions for inclusion in one district, as is the case in Illinois's 4th congressional district. One method is to define a minimum district to convex polygon ratio . To use this method, every proposed district is circumscribed by the smallest possible convex polygon (similar to the concept of a convex hull; think of stretching a rubberband around the outline of the district). Then, the area of the district is divided by the area of the polygon; or, if at the edge of the state, by the portion of the area of the polygon within state boundaries. The advantages of this method are that it allows a certain amount of human intervention to take place (thus solving the Colorado problem of splitline districting); it allows the borders of the district to follow existing jagged subdivisions, such as neighbourhoods or voting districts (something isoperimetric rules would discourage); and it allows concave coastline districts, such as the Florida gulf coast area. It would mostly eliminate bent districts, but still permit long, straight ones. However, since human intervention is still allowed, the gerrymandering issues of packing and cracking would still occur, just to a lesser extent. Start with the boundary outline of the state. Let N=A+B where N is the number of districts to create, and A and B are two whole numbers, either equal (if N is even) or differing by exactly one (if N is odd). For example, if N is 10, each of A and B would be 5. If N is 7, A would be 4 and B would be 3. Among all possible straight lines that split the state into two parts with the population ratio A:B, choose the shortest. If there are two or more such shortest lines, chose the one that is most north-south in direction; if there is still more than one possibility, chose the westernmost. We now have two hemi-states, each to contain a specified number (namely A and B) of districts. Handle them recursively via the same splitting procedure. Any human residence that is split in two or more parts by the resulting lines is considered to be a part of the most north-eastern of the resulting districts; if this doesn't decide it, then of the most northern. This district-drawing algorithm has the advantages of simplicity, ultra-low cost, a single possible result (thus no possibility of human interference), lack of intentional bias, and it produces simple boundaries that do not meander needlessly. It has the disadvantage of ignoring geographic features such as rivers, cliffs, and highways and cultural features such as tribal boundaries. This landscape oversight causes it to produce districts different from those an unbiased human would produce. Ignoring geographic features can induce very simple boundaries. While most districts produced by the method will be fairly compact and either roughly rectangular or triangular, some of the resulting districts can still be long and narrow strips (or triangles) of land. Like most automatic redistricting rules, the shortest splitline algorithm will fail to create majority-minority districts, for both ethnic and political minorities, if the minority populations are not very compact. This might reduce minority representation. Another criticism of the system is that splitline districts sometimes divide and diffuse the voters in a large metropolitan area. This condition is most likely to occur when one of the first splitlines cuts through the metropolitan area. It is often considered a drawback of the system because residents of the same agglomeration are assumed to be a community of common interest. This is most evident in the splitline allocation of Colorado. As of July 2007, shortest-splitline redistricting pictures, based on the results of the 2000 census, are available for all 50 states. It is possible to define a specific minimum isoperimetric quotient, proportional to the ratio between the area and the square of the perimeter of any given congressional voting district. Although technologies presently exist to define districts in this manner, there are no rules in place mandating their use, and no national movement to implement such a policy. One problem with the simplest version of this rule is that it would prevent incorporation of jagged natural boundaries, such as rivers or mountains; when such boundaries are required, such as at the edge of a state, certain districts may not be able to meet the required minima. One way of avoiding this problem is to allow districts which share a border with a state border to replace that border with a polygon or semi-circle enclosing the state boundary as a kind of virtual boundary definition, but using the actual perimeter of the district whenever this occurs inside the state boundaries. Enforcing a minimum isoperimetric quotient would encourage districts with a high ratio between area and perimeter. The introduction of modern computers alongside the development of elaborate voter databases and special districting software has made gerrymandering a far more precise science. Using such databases, political parties can obtain detailed information about every household including political party registration, previous campaign donations, and the number of times residents voted in previous elections and combine it with other predictors of voting behaviour such as age, income, race, or education level. With this data, gerrymandering politicians can predict the voting behaviour of each potential district with an astonishing degree of precision, leaving little chance for creating an accidentally competitive district. Among western democracies, Israel and the Netherlands employ electoral systems with only one (nationwide) voting district for election of national representatives. This virtually precludes gerrymandering. Gerrymandering has not typically been a problem in the Australian electoral system largely because drawing of electoral boundaries has typically been done by non-partisan bodies such as the Australian Electoral Commission. There have been historical cases of malapportionment whereby the distribution of electors to electorates was not in proportion to the population in several states. For example, Sir Thomas Playford served as Premier of South Australia from 1938 to 1965, the result of a system of malapportionment which became known as the Playmander, despite it not strictly speaking involving a gerrymander. More recently the nominally independent South Australian Electoral Districts Boundaries Commission has been accused of favouring the Australian Labor Party, as the party has been able to form government in four of the last seven elections, despite receiving a lower two-party preferred vote. In the state of Queensland, malapportionment combined with a gerrymander under Premier Sir Joh Bjelke-Petersen became nicknamed the Bjelkemander in the 1970s and 1980s. Under the system, electoral boundaries were drawn so that rural electorates had as few as half as many voters as metropolitan ones and regions with high levels of support for the opposition Labor Party were concentrated into fewer electorates, allowing Bjelke-Petersen's Country Party (later National Party) led Coalition government to remain in power despite attracting substantially less than 50% of the vote. For example, in the 1986 election, the National Party received 39.64% of the first preference vote and won 49 seats (in the 89 seat legislature) whilst the Labor Opposition received 41.35% but won only 30 seats. Early in Canadian history, both the federal and provincial levels used gerrymandering to try to maximise partisan power. When Alberta and Saskatchewan were admitted to Confederation in 1905, their original district boundaries were set forth in the respective Alberta and Saskatchewan Acts. These boundaries had been devised by federal Liberal cabinet members to ensure the election of provincial Liberal governments. Since responsibility for drawing federal and provincial electoral boundaries was handed over to independent agencies, this problem has largely been eliminated at these levels of government. Manitoba was the first province to authorise a non-partisan group to define constituency boundaries in the 1950s. In 1964, the federal government delegated the drawing of boundaries for national seats to the "arm's length" Elections Canada. As a result, gerrymandering is not generally a major issue in Canada except at the civic level. Although city wards are recommended by independent agencies, city councils occasionally overrule them. This is much more likely where the city is not homogenous and different neighbourhoods have sharply different opinions about city policy direction. In 2006, a controversy arose in Prince Edward Island over the provincial government's decision to throw out an electoral map drawn by an independent commission. Instead they created two new maps. The government adopted the second of these, designed by the caucus of the governing party. Opposition parties and the media attacked Premier Pat Binns for what they saw as gerrymandering of districts. Among other things, the government adopted a map that ensured that every current Member of the Legislative Assembly from the premier's party had a district to run in for re-election, whereas in the original map, several had been redistricted. Despite this, in the 2007 provincial election only seven of 20 incumbent Members of the Legislative Assembly were re-elected (seven did not run for re-election), and the government was defeated. The military government which ruled Chile from 1973 to 1990 was ousted in a national plebiscite in October 1988. Opponents of General Augusto Pinochet voted NO to remove him from power and to trigger democratic elections, while supporters (mostly from the right-wing) voted YES to keep him in office for another eight years. Five months prior to the plebiscite, the regime published a law regulating future elections and referendums, but the configuration of electoral districts and the manner in which Congress seats would be awarded were only added to the law seven months after the referendum. For the Chamber of Deputies (lower house), 60 districts were drawn by grouping (mostly) neighboring communes (the smallest administrative subdivision in the country) within the same region (the largest). It was established that two deputies would be elected per district, with the most voted coalition needing to outpoll its closest rival by a margin of more than 2-to-1 to take both seats. The results of the 1988 plebiscite show that neither the "NO" side nor the "YES" side outpolled the other by said margin in any of the newly established districts. They also showed that the vote/seat ratio was lower in districts which supported the "YES" side and higher in those where the "NO" was strongest. In spite of this, at the 1989 parliamentary election, the center-left opposition was able to capture both seats (the so-called doblaje) in twelve out of 60 districts, winning control of 60% of the Chamber. 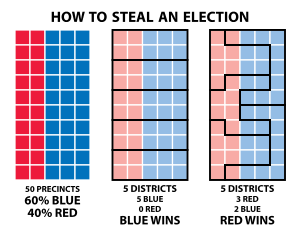 Senate constituencies were created by grouping all lower-chamber districts in a region, or by dividing a region into two constituencies of contiguous lower-chamber districts. The 1980 Constitution allocated a number of seats to appointed senators, making it harder for one side to change the Constitution by itself. The opposition won 22 senate seats in the 1989 election, taking both seats in three out of 19 constituencies, controlling 58% of the elected Senate, but only 47% of the full Senate. The unelected senators were eliminated in the 2005 constitutional reforms, but the electoral map has remained largely untouched (two new regions were created in 2007, one of which altered the composition of two senatorial constituencies; the first election to be affected by this minor change took place in 2013). France is one of the few countries to let legislatures redraw the map with no check, but in practice, an executive commission is set up by the legislature. Districts called arrondissements were used in the Third Republic and under the Fifth Republic they were called circonscriptions. During the Third Republic, some reforms of arrondissements, which were also used for administrative purposes, were largely suspected to have been arranged to favour the kingmaker in the Assembly, the Parti radical. In the modern regime, there were three designs: in 1958 (regime change), 1987 (by Charles Pasqua) and 2010 (by Alain Marleix), three times by conservative governments. Pasqua's drawing was known to have been particularly good a gerrymandering, resulting in 80% of the seats with 58% of the vote in 1993, and forcing Socialists in the 1997 snap election to enact multiple pacts with smaller parties in order to win again, this time as a coalition. In 2010, the Sarkozy government created 12 districts for expats. The Constitutional council was called twice by the opposition to decide about gerrymandering, but it never considered partisan disproportions. However, it forced the Marleix committee to respect an 80–120% ratio, ending a tradition dating back to the Revolution in which départements, however small in population, could send multiple MPs. Gerrymandering in France is also done against regionalist parties. Départements are always used even if they split urban areas or larger identity territories, and smaller identity divisions are avoided. When the electoral districts in Germany were redrawn in 2000, the ruling center-left Social Democratic Party (SPD) was accused of gerrymandering to marginalise the left-wing PDS party. The SPD combined traditional PDS strongholds in eastern Berlin with new districts made up of more populous areas of western Berlin, where the PDS had very limited following. After having won four seats in Berlin in the 1998 national election, the PDS was able to retain only two seats altogether in the 2002 elections. Under German electoral law, a political party has to win either more than five percent of the votes, or at least three directly elected seats, to qualify for top-up seats under the Additional Member System. The PDS vote fell below five percent thus they failed to qualify for top-up seats and were confined to just two members of the Bundestag, the German federal parliament (elected representatives are always allowed to hold their seats as individuals). Had they won a third constituency, the PDS would have gained at least 25 additional seats, which would have been enough to hold the balance of power in the Bundestag. In the election of 2005, The Left (successor of the PDS) gained 8.7% of the votes and thus qualified for top-up seats. The number of Bundestag seats of parties which traditionally get over 5% of the votes cannot be affected very much by gerrymandering, because seats are awarded to these parties on a proportional basis. However, when a party wins so many districts in any one of the 16 federal states that those seats alone count for more than its proportional share of the vote in that same state does the districting have some influence on larger parties—those extra seats, called "Überhangmandate", remain. In the Bundestag election of 2009, Angela Merkel's CDU/CSU gained 24 such extra seats, while no other party gained any; this skewed the result so much that the Federal Constitutional Court of Germany issued two rulings declaring the existing election laws invalid and requiring the Bundestag to pass a new law limiting such extra seats to no more than 15. Gerrymandering has been rather common in Greek history since organised parties with national ballots only appeared after the 1926 Constitution. The only case before that was the creation of the Piraeus electoral district in 1906, in order to give the Theotokis party a safe district. The most infamous case of gerrymandering was in the 1956 election. While in previous elections the districts were based on the prefecture level (νομός), for 1956 the country was split in districts of varying sizes, some being the size of prefectures, some the size of sub-prefectures (επαρχία) and others somewhere in between. In small districts the winning party would take all seats, in intermediate size it would take most and there was proportional representation in the largest districts. The districts were created in such a way that small districts were those that traditionally voted for the right while large districts were those that voted against the right. This system has become known as the three-phase (τριφασικό) system or the baklava system (because, as baklava is split into full pieces and corner pieces, the country was also split into disproportionate pieces). The opposition, being composed of the center and the left, formed a coalition with the sole intent of changing the electoral law and then calling new elections, despite the fact that only seven years earlier the center and the left had fought each other in the Greek Civil War. Even though the centrist and leftist opposition won the popular vote (1,620,007 votes against 1,594,992), the right wing ERE won the majority of seats (165 to 135) and was to lead the country for the next two years. In Hong Kong, although constituencies of district councils, the Urban Council, the Regional Council and the geographical constituencies of the Legislative Council have always been demarcated by the Boundary and Election Commission or its successor Electoral Affairs Commission, which is chaired by a judge, functional constituencies are demarcated by the government and defined in statutes, making them prone to gerrymandering. The functional constituency for the information technology sector was particular criticised for gerrymandering and voteplanting. In 2011, Fidesz politician János Lázár has proposed a redesign to Hungarian voting districts; considering the territorial results of previous elections, this redesign would favor right-wing politics according to the opposition. Since then, the law has been passed by the FIDESZ-majority Parliament. Formerly it took twice as many votes to gain a seat in some election districts as in some others. Until the 1980s Dáil boundaries in Ireland were drawn not by an independent commission but by government ministers. Successive arrangements by governments of all political characters have been attacked as gerrymandering. Ireland uses the single transferable vote and as well as the actual boundaries drawn the main tool of gerrymandering has been the number of seats per constituency used, with three-seat constituencies normally benefiting the strongest parties in an area, whereas four-seat constituencies normally help smaller parties. In 1947 the rapid rise of new party Clann na Poblachta threatened the position of the governing party Fianna Fáil. The government of Éamon de Valera introduced the Electoral (Amendment) Act 1947, which increased the size of the Dáil from 138 to 147 and increased the number of three-seat constituencies from fifteen to twenty-two. The result was described by the journalist and historian Tim Pat Coogan as "a blatant attempt at gerrymander which no Six County Unionist could have bettered." The following February the 1948 general election was held and Clann na Poblachta secured ten seats instead of the nineteen they would have received proportional to their vote. In the mid-1970s, the Minister for Local Government, James Tully, attempted to arrange the constituencies to ensure that the governing Fine Gael–Labour Party National Coalition would win a parliamentary majority. The Electoral (Amendment) Act 1974 was planned as a major reversal of previous gerrymandering by Fianna Fáil (then in opposition). Tully ensured that there were as many as possible three-seat constituencies where the governing parties were strong, in the expectation that the governing parties would each win a seat in many constituencies, relegating Fianna Fáil to one out of three. In areas where the governing parties were weak, four-seat constituencies were used so that the governing parties had a strong chance of still winning two. The election results created substantial change, as there was a larger than expected collapse in the vote. Fianna Fáil won a landslide victory in the Irish general election, 1977, two out of three seats in many cases, relegating the National Coalition parties to fight for the last seat. Consequently, the term "Tullymandering" was used to describe the phenomenon of a failed attempt at gerrymandering. From the years 1981 until 2005, Kuwait was divided into 25 electoral districts in order to over-represent the government's supporters (the 'tribes'). In July 2005, a new law for electoral reforms was approved which prevented electoral gerrymandering by cutting the number of electoral districts from 25 to 5. The practice of gerrymandering has been around in the country since its independence in 1957. The ruling coalition (National Front or Barisan Nasional) has been accused of controlling the election commission by revising the boundaries of constituencies. Most recently, in 2013, Barisan Nasional won 60% of the seats in the Malaysian Parliament despite only receiving 47% of the popular vote. Malapportionment has also been used at least since 1974, when it was observed that in one state alone (Perak), the parliamentary constituency with the most voters had more than ten times as many voters as the one with the fewest voters. The Labour Party that won in 1981, even though the Nationalist Party got the most votes, did so because of its gerrymandering. A 1987 constitutional amendment prevented that situation from reoccurring. After the restoration of democracy in 1990, Nepali politics has well exercised the practice of gerrymandering with the view to take advantage in the election. It was often practised by Nepali Congress, which remained in power in most of the time. Learning from this, the reshaping of constituency was done for constituent assembly and the opposition now wins elections. Congressional districts in the Philippines were originally based on an ordinance from the 1987 Constitution, which was created by the Constitutional Commission, which was ultimately based on legislative districts as they were drawn in 1907. The same constitution gave Congress of the Philippines the power to legislate new districts, either through a national redistricting bill or piecemeal redistricting per province or city. Congress has never passed a national redistricting bill since the approval of the 1987 constitution, while it has incrementally created 34 new districts, out of the 200 originally created in 1987. This allows Congress to create new districts once a place reaches 250,000 inhabitants, the minimum required for its creation. With this, local dynasties, through congressmen, can exert influence in the district-making process by creating bills carving new districts from old ones. In time, as the population of the Philippines increases, these districts, or groups of it, will be the basis of carving new provinces out of existing ones. An example was in Camarines Sur, where two districts were divided into three districts which allegedly favors the Andaya and the Arroyo families; it caused Rolando Andaya and Dato Arroyo, who would have otherwise run against each other, run in separate districts, with one district allegedly not even surpassing the 250,000-population minimum. The Supreme Court later ruled that the 250,000 population minimum does not apply to an additional district in a province. The resulting splits would later be the cause of another gerrymander, where the province would be split into a new province called Nueva Camarines; the bill was defeated in the Senate in 2013. In recent decades, critics have accused the ruling People's Action Party (PAP) of unfair electoral practices to maintain significant majorities in the Parliament of Singapore. Among the complaints are that the government uses gerrymandering. The Elections Department was established as part of the executive branch under the Prime Minister of Singapore, rather than as an independent body. Critics have accused it of giving the ruling party the power to decide polling districts and polling sites through electoral engineering, based on poll results in previous election. Members of opposition parties claim that the Group Representation Constituency system is "synonymous to gerrymandering", pointing out examples of Cheng San GRC and Eunos GRC which were dissolved by the Elections Department with voters redistributed to other constituencies after opposition parties gained ground in elections. In the most recent election of 2010, there were numerous examples of gerrymandering throughout the entire country of Sudan. A report from the Rift Valley Institute uncovered violations of Sudan's electoral law, where constituencies were created that were well below and above the required limit. According to Sudan's National Elections Act of 2008, no constituency can have a population that is 15% greater or less than the average constituency size. The Rift Valley Report uncovered a number of constituencies that are in violation of this rule. Examples include constituencies in Jonglei, Warrap, South Darfur, and several other states. Turkey has used gerrymandering in İstanbul in 2009 municipal elections. Just before the election İstanbul is divided in new counties. Large low income boroughs are bundled with rich boroughs to win municipal elections. "In Armagh there are 68,000 Protestants, 56,000 Catholics. The County Council has twenty-two Protestants and eight Catholics. In Tyrone, Catholics are a majority of the population, 82,000 against 68,000; but the electoral districts have been so arranged that Unionists return sixteen as against thirteen Nationalists (one a Protestant). This Council gives to the Unionists two to one majority on its Committees, and out of fifty-two officials employs only five Catholics. In Antrim, which has the largest Protestant majority (196,000 to 40,000), twenty-six Unionists and three Catholics are returned. Sixty officers out of sixty-five are good Unionists and Protestants." In the 1920s and 1930s, the Ulster Unionist Party created new electoral boundaries for the Londonderry County Borough Council to ensure election of a Unionist council in a city where Nationalists had a large majority and had won previous elections. Initially local parties drew the boundaries, but in the 1930s the province-wide government redrew them to reinforce the gerrymander. Some critics and supporters spoke at the time of "A Protestant Parliament for a Protestant People". In 1929, the Parliament of Northern Ireland passed a bill shifting the Parliament's electoral system from the relatively proportional single transferable vote (STV) to the less proportional first past the post or plurality voting system. The only exception was for the election of four Stormont MPs to represent the Queen's University of Belfast. Many scholars believe that the boundaries were gerrymandered to underrepresent Nationalists. Some geographers and historians, for instance Professor John H. Whyte, disagree. They have argued that the electoral boundaries for the Parliament of Northern Ireland were not gerrymandered to a greater level than that produced by any single-winner election system, and that the actual number of Nationalist MPs barely changed under the revised system (it went from 12 to 11 and later went back up to 12). Most observers have acknowledged that the change to a single-winner system was a key factor, however, in stifling the growth of smaller political parties, such as the Northern Ireland Labour Party and Independent Unionists. The United Kingdom suspended the Parliament of Northern Ireland and its government in 1972. It restored the single transferable vote (STV) for elections to the Northern Ireland Assembly in the following year, using the same definitions of constituencies as for the Westminster Parliament. Currently in Northern Ireland, all elections use the STV except those for positions in the Westminster Parliament, which follow the pattern in the rest of the United Kingdom by using "first past the post." Scotland and Wales being favoured in the Westminster Parliament with deliberately smaller electoral quotas (average electors per constituency) than those in England and Northern Ireland. This inequality was initiated by the House of Commons (Redistribution of Seats) Act 1958, which eliminated the previous common electoral quota for the whole United Kingdom and replaced it with four separate national quotas for the respective Boundaries commissions to work to: England 69,534; Northern Ireland 67,145, Wales 58,383 and in Scotland only 54,741 electors. Current rules historically favouring geographically "natural" districts, this continues to give proportionally greater representation to Wales and Scotland. Population migrations, due to white flight and deindustrialization tending to decrease the number of electors in inner-city districts. Under the Sixth Periodic Review of Westminster constituencies, the Coalition government planned to review and redraw the parliamentary constituency boundaries for the House of Commons of the United Kingdom. The review and redistricting was to be carried out by the four UK boundary commissions to produce a reduction from 650 to 600 seats, and more uniform sizes, such that a constituency was to have no fewer than 70,583 and no more than 80,473 electors. The process was intended to address historic malapportionment, and be complete by 2015. Preliminary reports suggesting the areas set to lose the fewest seats historically tended to vote Conservative, while other less populous and deindustrialized regions, such as Wales, which would lose a larger proportion of its seats, tending to have more Labour and Liberal Democrat voters, partially correcting the existing malapportionment. An opposition (Labour) motion to suspend the review until after the next general election was tabled in the House of Lords and a vote called in the United Kingdom House of Commons, in January 2013. The motion was passed with the help of the Liberal Democrats, going back on an election pledge. As at October 2016, a new review is in progress and a draft of the new boundaries has been published. U.S. congressional districts covering Travis County, Texas (outlined in red) in 2002, left, and 2004, right. 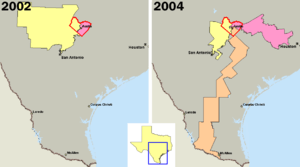 In 2003, the majority of Republicans in the Texas legislature redistricted the state, diluting the voting power of the heavily Democratic county by parcelling its residents out to more Republican districts. Shaw v. Reno was a United States Supreme Court case involving the redistricting and racial gerrymandering of North Carolina's 12th congressional district (pictured). The United States, among the first with an elected representative government, eventually named the practice. Incidents precede the 1789 election of the First U.S. Congress. In 1788, Patrick Henry and his Anti-Federalist allies were in control of the Virginia House of Delegates. They drew the boundaries of Virginia's 5th congressional district in an unsuccessful attempt to keep James Madison out of the U.S. House of Representatives. The practice of gerrymandering the borders of new states continued past the Civil War and into the late 19th century. The Republican Party used its control of Congress to secure the admission of more states in territories friendly to their party—the admission of Dakota Territory as two states instead of one being a notable example. By the rules for representation in the Electoral College, each new state carried at least three electoral votes regardless of its population. All redistricting in the United States has been contentious because it has been controlled by political parties vying for power. As a consequence of the decennial census required by the United States Constitution, districts for members of the House of Representatives typically need to be redrawn. In many states, state legislatures have redrawn boundaries for state legislative districts at the same time. State legislatures have used gerrymandering along racial lines both to decrease and increase minority representation in state governments and congressional delegations. In the state of Ohio, a conversation between Republican officials was recorded that demonstrated that redistricting was being done to aid their political candidates. Furthermore, the discussions assessed race of voters as a factor in redistricting, because African-Americans had backed Democratic candidates. Republicans apparently removed approximately 13,000 African American voters from the district of Jim Raussen, a Republican candidate for the House of Representatives, in an attempt to tip the scales in what was once a competitive district for Democratic candidates. With the Civil Rights Movement and passage of the Voting Rights Act of 1965, federal enforcement and protections of suffrage for all citizens were enacted. Gerrymandering for the purpose of reducing the political influence of a racial or ethnic minority group was prohibited. After the Voting Rights Act of 1965 was passed, some states created "majority-minority" districts to enhance minority voting strength. This practice, also called "affirmative gerrymandering", was supposed to redress historic discrimination and ensure that ethnic minorities would gain some seats and representation in government. In some states, bipartisan gerrymandering is the norm. State legislators from both parties sometimes agree to draw congressional district boundaries in a way that ensures the re-election of most or all incumbent representatives from both parties. Rather than allowing more political influence, some states have shifted redistricting authority from politicians and given it to non-partisan redistricting commissions. The states of Washington, Arizona, and California have created standing committees for redistricting following the 2010 census. Rhode Island and New Jersey have developed ad hoc committees, but developed the past two decennial reapportionments tied to new census data. Florida's amendments 5 and 6, meanwhile, established rules for the creation of districts but did not mandate an independent commission. International election observers from the Organization for Security and Co-operation in Europe Office for Democratic Institutions and Human Rights, who were invited to observe and report on the 2004 national elections, expressed criticism of the U.S. congressional redistricting process and made a recommendation that the procedures be reviewed to ensure genuine competitiveness of Congressional election contests. In 2015, an analyst reported that the two major parties differ in the way they redraw districts. The Democrats construct coalition districts of liberals and minorities together with conservatives which results in Democratic-leaning districts. The Republicans tend to place liberals altogether in a district, conservatives in others, creating clear partisan districts. Prior to the 26 September 2010 legislative elections, gerrymandering took place via an addendum to the electoral law by the National Assembly of Venezuela . In the subsequent election, Hugo Chávez's political party, the United Socialist Party of Venezuela drew 48% of the votes overall, while the opposition parties (the Democratic Unity Roundtable and the Fatherland for All parties) drew 52% of the votes. However, due to the re-allocation of electoral legislative districts prior to the election, Chávez's United Socialist Party of Venezuela was awarded over 60% of the spots in the National Assembly (98 deputies), while 67 deputies were elected for the two opposition parties combined. In a play on words, the use of race-conscious procedures in jury selection has been termed "jurymandering". 1 2 Griffith, Elmer (1907). The Rise and Development of the Gerrymander. Chicago: Scott, Foresman and Co. pp. 72–73. OCLC 45790508. ↑ Martis, Kenneth C. (2008). "The Original Gerrymander". Political Geography. 27 (4): 833–839. doi:10.1016/j.polgeo.2008.09.003. ↑ There is no evidence that the famous American portrait painter Gilbert Stuart had any involvement with either the design, drawing, or naming of the cartoon, or with the coining of the term. Detailed biographies and academic journal articles about Stuart make no reference to gerrymandering. The myth of Stuart’s association with the original gerrymander has been reproduced and spread without verification or sources, from one reference book and Internet site to another. Modern scholars of Stuart agree that no proof exists to credit him with the term or cartoon and that he tended not to be involved with such issues. Martis, Kenneth C. (2008). "The Original Gerrymander". Political Geography. 27 (4): 833–839. doi:10.1016/j.polgeo.2008.09.003. ↑ O’Brien, D. C. (1984). "Elkanah Tisdale: Designer, Engraver and Miniature Painter". Connecticut Historical Bulletin. 49 (2): 83–96. ↑ Library of Congress. Original woodblocks for printing "Gerrymander" political cartoon. Geography and Map Reading Room. LCCN Permalink: http://lccn.loc.gov/2003620165. ↑ The word gerrymander was used again in two Boston-area papers the next day. The first usage outside of the immediate Boston area appeared in the Newburyport Herald (Massachusetts) on 31 March, and the first use outside of Massachusetts came in the Concord Gazette (New Hampshire) on 14 April 1812. The first use outside of New England was published in the New York Gazette & General Advertiser on 19 May. What may be the first use of the term to describe the redistricting in another state (Maryland) occurred in the Federal Republican (Georgetown, D.C.) on 12 October 1812. All in all, there are at least 80 known citations of the word from March through December 1812 in American newspapers. Martis, Kenneth C. (2008). "The Original Gerrymander". Political Geography. 27 (4): 833–839. doi:10.1016/j.polgeo.2008.09.003. ↑ Simpson, J. A., Weiner, E. S. C. "Gerrymander", Oxford English Dictionary. New York: Oxford University Press. ↑ Thomas B. Hofeller, "The Looming Redistricting Reform; How will the Republican Party Fare? ", Politico, 2011. ↑ David Wasserman, "'Perrymander': Redistricting Map That Rick Perry Signed Has Texas Hispanics Up in Arms", National Journal, 19 August 2011. Archived 9 May 2012 at the Wayback Machine. ↑ Mark Gersh, "Redistricting Journal: Showdown in Texas—reasons and implications for the House, and Hispanic vote", CBS News, 21 September 2011; accessed 2012.05.14. ↑ Donald Harman, Akenson (1994). "Chapter 12: Kildare Street to Fleet Street". Conor. Vol1. McGill-Queen's Press - MQUP. p. 431. ISBN 077351256X. Retrieved 15 November 2016 – via Google Books. ↑ Michel Balinski, "Fair Majority Voting (or How to Eliminate Gerrymandering)" Amer. Math. Monthly 115 2 (2008): 97. "Incumbent candidates, in tailored districts, are almost certain of reelection (over 98% in 2002, over 94% in 2006)". ↑ "gerrymandering - politics". Encyclopedia Britannica. ↑ Stephanopoulos, Nicholas; McGhee, Eric (2014). "Partisan Gerrymandering and the Efficiency Gap". University of Chicago Law Review. 82: 831. Retrieved 2016-11-22. ↑ Stephanopoulos, Nicholas (July 2, 2014). "Here's How We Can End Gerrymandering Once and for All". The New Republic. Retrieved 2016-11-22. ↑ Wines, Michael (Nov 21, 2016). "Judges Find Wisconsin Redistricting Unfairly Favored Republicans". New York Times. Retrieved 2016-11-22. ↑ Seth E. Masket, Jonathan Winburn and Gerald C. Wright, The Gerrymanderers Are Coming! Legislative Redistricting Won't Affect Competition or Polarization Much, No Matter Who Does It. ↑ Forgette, Richard; Winkle, John W. (March 2006). "Partisan Gerrymandering and the Voting Rights Act*". Social Science Quarterly. 87 (1): 155–173. doi:10.1111/j.0038-4941.2006.00374.x. ↑ McCarty, Nolan; Poole, Keith T.; Rosenthal, Howard (July 2009). "Does Gerrymandering Cause Polarization?". American Journal of Political Science. 53 (3): 666–680. doi:10.1111/j.1540-5907.2009.00393.x. 1 2 "Iowa's Redistricting Process: An Example of the Right Way to Draw Legislative". Centrists.Org. 22 July 2004. Archived from the original on 7 November 2009. Retrieved 5 August 2009. ↑ "Redistricting in Michigan". ballotpedia.org. ↑ Prison-Based Gerrymandering – New York Times editorial, New York Times, 20 May 2006. ↑ "Issue 4: Independent Redistricting Process – Ohio State Government". Smartvoter.org. Retrieved 5 August 2009. ↑ "Redistricting Transparency Act of 2010 (2010; 111th Congress H.R. 4918) - GovTrack.us". GovTrack.us. ↑ "Redistricting Transparency Act of 2011 (2011; 112th Congress H.R. 419) - GovTrack.us". GovTrack.us. ↑ "Redistricting Transparency Act of 2013 (2013; 113th Congress H.R. 337) - GovTrack.us". GovTrack.us. ↑ See, e.g., Richard L. Engstrom, The Single Transferable Vote: An Alternative Remedy for Minority Vote Dilution, 27 U.S.F.L.Rev. 781, 806 (1993) (arguing that the Single Transferable Voting systems maintain minority electoral opportunities); Steven J. Mulroy, Alternative Ways Out: A Remedial Road Map for the Use of Alternative Electoral Systems as Voting Rights Act Remedies, 77 N.C.L.Rev. 1867, 1923 (1999) (concluding that ranked-ballot voting systems avoid minority vote dilution); Steven J. Mulroy, The Way Out: A Legal Standard for Imposing Alternative Electoral Systems as Voting Rights Remedies, 33 Harv.C.R.-C.L.L.Rev. 333, 350 (1998) (arguing that preferential voting systems enhance minority representation); and Alexander Athan Yanos, Note, Reconciling the Right to Vote With the Voting Rights Act, 92 Colum.L.Rev. 1810, 1865–66 (1992) (arguing that Single Transferable Voting serves to preserve the minority party's right to representation). ↑ Dr. Michael McDonald, U.S. Elections Project: Alabama Redistricting Summary Dept. of Public and International Affairs George Mason University. Retrieved 6 April 2008. Archived 24 June 2008 at the Wayback Machine. ↑ Reynolds v. Sims states that "a state legislative apportionment scheme may properly give representation to various political subdivisions and provide for compact districts of contiguous territory if substantial equality among districts is maintained." See also the Wikipedia article. ↑ "Gerrymandering and a cure—shortest splitline algorithm". RangeVoting.org. Retrieved 5 August 2009. ↑ "RangeVoting.org – Center for Range Voting". ↑ "Splitline districtings of all 50 states + DC + PR". RangeVoting.org. Retrieved 5 August 2009. 1 2 "James Case "Flagrant Gerrymandering: Help from the Isoperimetric Theorem?"" (PDF). Retrieved 19 December 2010. ↑ Tilby Stock, Jenny (1996). "The 'Playmander': its origins, operations and effect on South Australia". In O'Neil, Bernard; Raftery, Judith; Round, Kerrie. Playford's South Australia: Essays on the History of South Australia, 1933–1968. Association of Professional Historians. pp. 73–90. ISBN 0646290924. ↑ Orr, Graham D.; Levy, Ron (2009). "Electoral Malapportionment: Partisanship, Rhetoric and Reform in the Shadow of the Agrarian Strong-Man". Griffith Law Review. 18 (18): 638–665. ↑ Australian Government and Politics Database. "Parliament of Queensland, Assembly election, 1 November 1986". Retrieved 17 July 2013. ↑ "No Christmas election: Binns". cbc.ca, 16 November 2006. Archived 2 July 2009 at the Wayback Machine. ↑ "LEY-18700 06-MAY-1988 MINISTERIO DEL INTERIOR". Leychile.cl. Retrieved 19 December 2010. ↑ "LEY-18799 26-MAY-1989 MINISTERIO DEL INTERIOR". Leychile.cl. Retrieved 19 December 2010. ↑ Documento de trabajo. Programa FLACSO-Chile. Número 428, septiembre 1989. FLACSO Chile Biblioteca. ↑ Rojas, Priscilla and Patricio Navia (2005). "Representación y tamaño de los distritos electorales en Chile, 1988-2002" (in Spanish). Revista de ciencia política (Santiago). ↑ "Legislative Council Ordinance". hklii.org. ↑ "Archived copy". Archived from the original on 25 May 2012. Retrieved 29 March 2011. ↑ "Index – Belföld – Így lesz jobboldali Magyarország". Index.hu. Retrieved 18 November 2012. ↑ "Index – Belföld – Elfogadták az új választójogi törvényt". Index.hu. Retrieved 18 November 2012. ↑ Hornyák József:. "Fellebbez a Political Capital a választókerületi aránytalanságok miatt | Közélet | Világgazdaság Online". Vg.hu. Retrieved 18 November 2012. ↑ "The Changing Nature of the Parliamentary System in Kuwait" (PDF). p. 63 & 70. Due to the gerrymandering on the part of the government, the “tribes” from the 1980s onwards, came to occupy a significant number of seats in the National Assembly. ↑ "What's Malay for gerrymandering?". The Economist. Kuala Lumpur. 9 August 2014. Retrieved 9 November 2014. ↑ Yang Berhomat Dr. Ong, Kiang Ming MP (2013-07-19). "Malaysia among the most malapportioned countries in the world". Retrieved 2016-02-19. ↑ Calica, Aurea (18 March 2010). "Noynoy hits creation of Camarines Sur district for Dato". The Philippine Star. Retrieved 30 July 2013. ↑ Mendez, Christina (9 April 2010). "'Supreme Court ruling on Camsur clears Senate'". The Philippine Star. Retrieved 30 July 2013. ↑ Prime Minister's Office, Our Departments Archived 7 June 2008 at the Wayback Machine. ↑ Lim, Lydia; HUSSAIN, ZAKIR (2 August 2008). "Insight: GRCs: 20 years on". Straits Times. Singapore. Retrieved 8 August 2015. ↑ "Rift Valley Report" (PDF). Archived from the original (PDF) on 26 April 2014. Retrieved 19 December 2010. 1 2 3 "CAIN: Issues – Discrimination: John Whyte, 'How much discrimination was there under the Unionist regime, 1921–1968?'". Cain.ulst.ac.uk. Retrieved 5 August 2009. ↑ "Northern Ireland House of Commons, 1921–1972". Ark.ac.uk. Retrieved 5 August 2009. ↑ "Q&A: Boundary changes". BBC. 29 January 2013. Retrieved 14 February 2013. ↑ "Election 2010 Results". BBC. 6 May 2010. Retrieved 14 February 2013. ↑ Compare a map of the United States in 1860 with a map from 1870 . ↑ "Republican Party Politics (Part II)". WCPO. Associated Press. 29 April 2002. Archived from the original on 15 May 2013. ↑ "In Virginia, an incumbent protection plan". The Washington Post. 29 September 2013. Retrieved 21 April 2016. ↑ Washington State Redistricting Commission "Washington State Redistricting Commission". Redistricting.wa.gov. Retrieved 5 August 2009. ↑ Arizona Independent Redistricting Commission "Arizona Independent Redistricting Commission". Azredistricting.org. Retrieved 5 August 2009. ↑ Rhode Island Reapportionment Commission Archived 18 October 2007. ↑ "Election 2010: Palm Beach County & Florida Voting, Candidates, Endorsements | The Palm Beach Post". Projects.palmbeachpost.com. Archived from the original on 8 December 2010. Retrieved 19 December 2010. ↑ "XI" (PDF). Retrieved 5 August 2009. ↑ King, Ledyard (November 28, 2015). "Democrats face long house odds". Florida Today. Melbourne, Florida. pp. 1B. Retrieved November 28, 2015. ↑ Gerrymandering during parliament election "Parliament election was an unmistakable rebuff to Chávez" Check |url= value (help). Washington Post. Washington, D.C. October 1, 2010. Retrieved February 10, 2015. Look up gerrymander or gerrymandering in Wiktionary, the free dictionary. Wikimedia Commons has media related to Gerrymandering. Understanding Congressional Gerrymandering: 'It's Moneyball Applied To Politics'. Interview with Ratf**ked author David Daley. NPR, 15 June 2016. Gerrymandering: A documentary film written/directed by Jeff Reichert - offers an audience-friendly definition of the term "gerrymandering," provides examples of unfair redistricting practices in the United States, and follows the fight to pass Proposition 11 in California's 2008 elections. 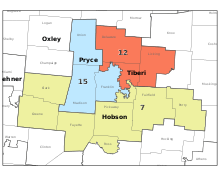 A collection of bizarre and unconstitutional districts from recent history, dedicated to Governor Eldridge Gerry. Gerryminder – An online redistricting simulation. The Redistricting Game - Where Do You Draw the Lines A simulation of how redistricting works. It uses the real US laws and practices and incorporates quotes from US political leaders. Redrawing Lines of Power: Redistricting 2011 Making Contact, produced by National Radio Project. 12 April 2011. Polk, James. "Why your vote for Congress might not matter." CNN. Friday 18 November 2011.